This blog is a series of posts by Allan Wright, owner of Zephyr Adventures. Allan will post once every few weeks or months about his travels and Zephyr's tours. Zephyr Adventures runs inline skating, wine, trekking, self-guided, and family vacations on four continents. To be emailed each time Allan posts a new entry, visit http://groups.yahoo.com/group/zephyrtours. We have upgraded our blogging software and now host the Zephyr Adventures blog on our own site. As of March 2008 the existing posts below and all future posts will be at www.ZephyrAdventures.com/blog. It is amazing this is my 17th posting on the Zephyr Adventures Blog and the first one about our Netherlands Skating Adventure. We have been running our Netherlands skate tour since 1997. It was our very first tour location and the only location back in that first year. 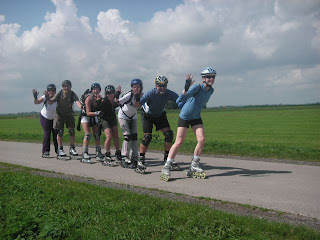 I still remember wondering whether the concept of skating through the Netherlands on inline skates would work. Eleven years later, the success has been proven. This Netherlands tour in 2008 will be our 25th skate tour in that country. Let's face it. One of the reasons the Netherlands is such a great place for a skate tour is it is flat. The only hills we ever face there are when we go up and over a freeway on one of the small country roads or bike paths we use there. The bike paths are another reason the country is so perfect for skate touring. Every single town in the northern provinces where we skate are connected to each other by paved paths. The Dutch are living 21st century transportation methods. However, I think when it comes down to it the reason the Netherlands tour is so popular with us is the culture. The Dutch are very open and warm, the landscapes are beautiful, and sitting on a hotel front porch with a beer after a long skate can make you feel you've hit life's zenith. I like that - hitting your zenith with Zephyr. In 2008, we have made a few changes to our Netherlands tour. First off, we changed our route so we skate directly from Amsterdam to our first hotel in the countryside. This eliminates a shuttle and will also give our skaters, I am sure, a sense of major accomplishment the first day. We even get to use a ferry to cross a canal on our way out of the city. Second, this tour is a Fitness Tour, designed for intermediate and better skaters. Some participants will be on racing skates but most will be just regular skaters who like to go long and steadily. If you have never skated in a peloton skating pack but would like to try, this is your opportunity. Finally, we are working hard to get Canadian skating legend Barry Publow on the trip as a guest guide. Barry was originally signed up to join us but had to cancel last fall. In the interim, I made other plans and we now have two great Zephyr guides on this trip, one Dutch (Irene) and one American (Andrea). After hearing from Barry just this week he is now available again, I agreed with him he will be our third guide on the trip if we hit 17 participants. We are at nine now and I hope with Barry's planned participation we will hit 17 or more. Barry skated for the Canadian national team and runs a speed skating website, www.breakawayskate.com. More importantly, he is known as one of the best technicians in the skating world. If you want to learn how to double push, Barry is your guy. You'll have that opportunity on our Netherlands tour as Barry teaches formal clinics in the morning and gives you tips during the days of skating. Come join us on our 25th skate tour in The Netherlands, June 21 through June 27. "Oh my gosh. Look at that elephant." 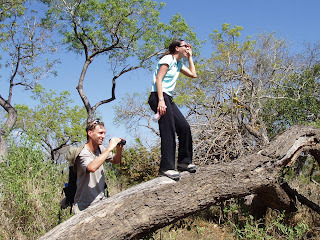 We were on the second day of our three-day South Africa safari and participating in a "bush walk". My girlfriend Devon and I were joined by one other couple and our khaki-wearing, rifle-toting guide Jonathan. Now, seeing an elephant on a safari is a common event. However, this elephant caught us by surprise, ambling towards us from over the horizon as our attention was on a nearby watering hole, our minds speculating whether the water buffalo we were watching would get close enough to the crocodile lurking in the water to create some excitement. 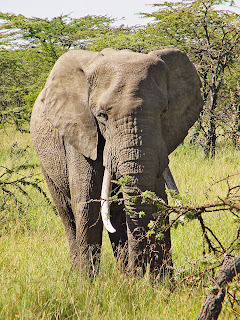 Now, however, our thoughts and eyes were diverted, flicking back and forth from the watering hole to the big full elephant coming for a drink, still far away but certainly impressive with his ears waving like flags in a soft breeze. The funny thing was, either my geometry was off or the elephant was angling more towards us than the pool. "Now don't get excited", said Jonathan. "But I want all of you to very casually move behind that bush." Clearly, Jonathan's geometry calculation was the same as mine and he was wondering about the elephant's intentions also. A few more minutes and the distance was closing. The elephant was clearly moving more towards us than the watering hole. "Now, again, I want you to move very casually from behind that bush to this tree", instructed Jonathan. "Get in single file behind the tree and minimize the elephant's view of us." I asked later and Jonathan told me the bush was good for concealing us but the tree made for better protection. At this point, all of us were at least nervous. Except perhaps Jonathan. Devon was first in line. With her face buried in the tree, she had given up any thought of watching the elephant. I was next, poking my head out to keep on eye on the several tons of flesh ambling on a path that seemed to be directly towards us. Ultimately, the elephant swerved and headed away from us and towards the pond, passing no more than 20 feet from our tree. We were all relieved and excited and I am sure all of us (except, again, Jonathan) still tell the story over a year later. It was an excellent example of how incredibly memorable a safari can be. This was the only safari I have done in my life, which seems a little strange in hindsight since I have traveled over much of the world and have been to many places multiple times. I think I had always felt safaris were, well, overrated. A conversation I had just a few days ago confirmed this. I was telling my friend Rob, an avid traveler and outdoors man, about the elephant experience and he listened with a questioning look on his face. "Are safaris really that fun?" he asked. Safaris are not overrated. They are an incredible experience for everyone ... and you don't have to interact on foot with elephants to enjoy them. On our scheduled October 2008 South Africa Adventure, we will spend three days and two nights at the Chapungu Bush Lodge in a private reserve near Kruger National Park. The main game viewing is done on bush drives, in a very safe Landrover that allows us to cover long distances and go where the animals are active. These drives are amazing and will rate up there with any vacation you have done. The foot safaris are offered each afternoon and are entirely optional. Me? I thought the foot safaris were the best part of the experience. I loved being out in the open, knowing I was unlikely to encounter any real danger but still excited at no longer being at the top of the food chain. (It was also nice to get a little exercise.) However, the foot safaris are optional so you can choose to participate or not. Whatever you decide, you will love the creature comforts of our tented lodge. The meals are superb, the wine flows, the staff is nice beyond what we expect, and the tales we tell at night reflect the incredible sights and experiences we live each day. P.S. For information on the active wine portion of our South Africa Adventure, see my Travels With Wine blog. a nice, hot shower and a big, clean bed with a warm blanket. zippers were extremely easy to open and close. beverages and soups to keep us warm. it’s safe to walk just a few feet away from your tent and find a good spot. I would highly recommend this trip! Exactly one year ago I posted an entry titled Tibet Trekking. Scroll down to read the post. 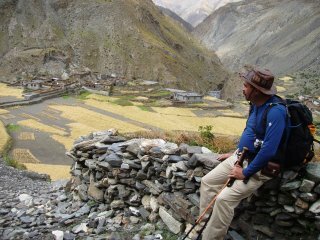 In that entry, I related the story of Dekay, the granddaughter of one of the elders of the village we visit on our trek each year. I had met her in the village and after a few translated discussions through our local guide Tenzin, decided to sponsor her for a year of English school in Lhasa, the capital, where she had never been. What a life change that must have been for her! Would she miss her village? Would she study hard and learn English? Would life in the capital change her? "Dekay took her first day off from school in a year and spent it walking around with our group on our first full day in Lhasa. It was amazing to actually be communicating with her in English. She has obviously been working very hard and says she often spends weekend days in the Barkhor listening to tour guides speaking to their groups in English or conversing with friendly English-speaking travelers when she can. On our last day in Lhasa, after the trek, Tenzin took me to visit Dekay's Aunt in the tea shop where she works and Dekay sometimes helps out. I drank tea until I thought I could hold no more and Tenzin translated for us while we chatted. Then Dekay, Tenzin and I went to see Dekay's school. It looked very run down by Western standards, with peeling paint and sparse classrooms, although they had painted cute motivational sayings in bright colors on the wall in English like "It's easy! It's fun!" Dekay showed me her English book. It was book 5 of a series of workbooks. They do a lesson per day, which seems pretty fast. We also ran into her teacher in the street near the school. He says she is one of the best students. He is also young and handsome and I later asked Dekay if she thought he was cute and she just giggled. She's a sweetheart and I'm happy to report that city life does not seem to have corrupted her at all. Next we visited a stationery shop and I bought pens and pads of paper for her whole class of 40 students, plus some extra supplies just for her (pencil box, highlighter, etc.) and a coloring set for her Aunt's young children. I also bought a globe for her teacher and showed her where you and I live. It was hard to get her to select things for herself. Shopping for her was probably the highlight of my trip." Needless to say, on my behalf Kathy paid the next year of school tuition for Dekay. Recently, Dekay has obtained an email address and we write once per week or so. For Dekay, it is an excellent opportunity to practice English. For me, it is a reminder of my friends in Tibet and how the world is so small despite our differences. Note: I did not supply photos of Dekay for this post as it is sadly still best in China-occupied Tibet to downplay contact with locals. The photo is of our group of trekkers with guide Kathy (lower right). It was a tag team approach this year as we checked out the Mosel Valley for our new Skating Adventure. Zephyr's German guide Sabine, based in Switzerland, visited the area in May to see if it was a suitable tour location. I then followed up last month to set up the details. The Mosel Valley, created by the Mosel River, actually starts in France, runs along Luxembourg, and then heads into Germany. It is known as a vacation area, for its wines, and more recently for the 535.5 kilometers of paved trail running along both sides of the river! "We had 5 days of great skating! We were skating every day. Luisa was skating around 200km, and take a day off. She was a good exemple, like a typical Zephyr Tourist… ( her speed, and how often she wand to take a time out). We were skating around 250km.Very nice scenery. The streets are all to skate. Most of them are very good. The towns are nice and some of them are really beautiful. The people were very friendly! It’s a good place for a Zephyr tour!" Since Sabine had already checked out the skating, my girlfriend Devon and I were left with the organizational details! We checked out hotels, restaurants, transportation options - and of course got in some skating, too. The Mosel Valley is beautiful. The river has cut a path through the hills, so both banks of the river rise up above the valley floor. Wine has become a major industry in the area and vineyards cover both banks for much of the valley's length. Cute German towns are spaced about 5-10 kilometers apart, making for nice destinations on the routes. I think three unique items make this a wonderful skate tour. First, the Germans have done an amazing job at creating the paths that line the river. 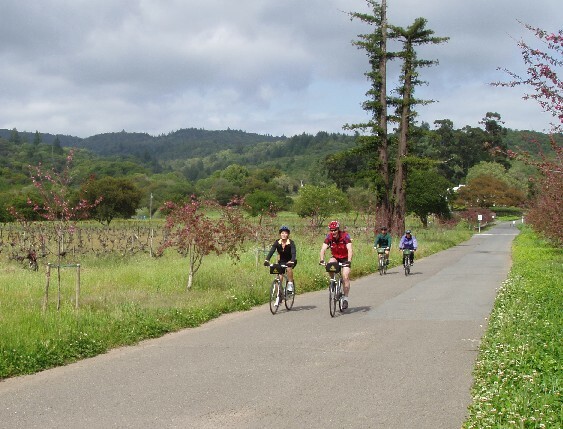 For much of the time, the trails are separate bike paths that run through fields or vineyards. Sometimes the paths are small side roads and at other times they are simply marked lanes on the side of a road. The nice thing is that with a trail on both sides of the river, we use the many bridges to cross back and forth so we can pick the best skating surfaces the whole way. The second thing I really like about this trip are the "shuttling" options. 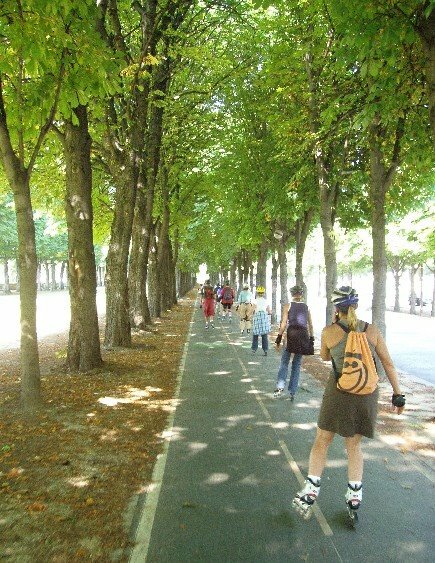 Because we will essentially skate or bike in a linear path along the river from France to Germany (neither the river nor the trails are at all straight), the Long Routes each day will go from hotel to hotel. That means the Short and Medium Routes will require a shuttle. But instead of simply having a van shuttle, we use a combination of our van, the local train system, and ferry boats that ply the river to get people to and from the best skating parts of each day. It really adds a nice cultural twist to the tour. Finally, I love that this tour involves three countries. We meet you in Thionville, France and spend the first night in Remich, Luxembourg before heading into Germany. It is a great mix - and if you like wine, so much the better! We will run two tours next year in Germany and I am confident they will be full by October 31. Come join us July 13-19 or July 20-26 next year! 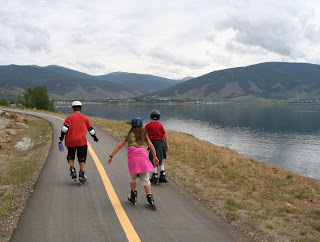 I just returned from our Family Multisport Adventure in Colorado - the third Family Adventure in the past three years I had the pleasure of guiding. For an introduction to our Family Adventures and how they operate, please scroll down to the post of last August about our Lake Tahoe trip. That posting will give you a good idea of our philosophy of providing activity levels for everyone, separating the kids and adults enough to let the kids bond and give the adults some relaxation, and keeping everyone together at other times as one big fun group. Colorado is the perfect place for a family vacation. Once we left Denver and the airport, we had wide-open spaces, 14,000-foot mountains, and rushing rivers in our backyard. During this six-day tour we rode horses, rafted on a whitewater river, biked, skated, and hiked. We also watched a rodeo, visited a ghost town, and played with puppies at a local dog sledding operation. We had a ton to do during the day and good food to eat at night. We had a very large group of 28 participants plus three guides. 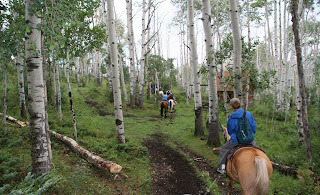 Even when we split in two groups, it was amazing to see all these people on horseback, riding through aspen groves on a real Colorado ranch. The river rafting, where we had a private group of five rafts floating down the river, was probably the highlight for many in the group. 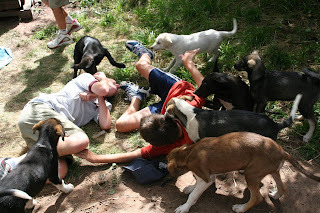 However, I know the younger kids loved being licked to death by the puppies at the dog sled kennels. For me personally, the highlight of the trip was our "split" dinner in which we divided into the "fogies" and the "fun group". My co-guide Reno took the adults to a nice dinner while our other co-guide Sonya and I took the kids out for pizza. We had reserved an entire dance club and game room (not normally open that evening) for our evening kids meal. After wolfing down five pizzas, the group immediately spread out to play games: pool, air hockey, and darts. Funny enough, the hit game of the evening was shuffle board - at least until Caleb, Erica, and Mari took over as DJs to light up the dance floor. The great thing about this evening was that we had kids from six different families who were winging darts, hitting pool balls, and throwing whatever it is you throw in shuffleboard as if they were fast friends with decades of past experiences together. These were kids from all areas of the country with different backgrounds and different ages. Yet, they bonded as one fun group. I don't have kids myself but I do have a niece (Erica) and nephew (Brian), who were on this trip with my brother Dave and sister-in-law Sharon. I was also a kid myself once and remember squabbling with my two brothers in the back of our station wagon, asking repeatedly when we would arrive to our destination. I have the feeling that normal "family vacations" are at least as stressful as they are fun and rewarding. This tour was not that way at all, neither for the parents nor the guides. We try hard to make these trips fun for the parents as well as the kids. We keep the group together at times, because we know parents love watching their kids have fun while experiencing new activities. At other times, we split them apart so parents can relax, have a glass of wine, and engage in some adult conversation - all while knowing their kids are well looked after by our guides. As guides, frankly, these tours are not that difficult. The kids simply know how to have fun and that makes our job easy. Come join us next year on a Family Adventure in either Yellowstone National Park or Glacier National Park, two jewels of the US park system and great places for family fun. 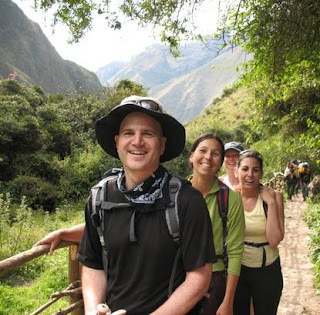 I just returned to the United States from one of our new trips launched this year, Trekking in Peru. The lost city of Machu Picchu is by far the most famous travel destination in Peru and the four-day Inca Trail is known worldwide as one of the greatest adventure travel experiences on the globe. 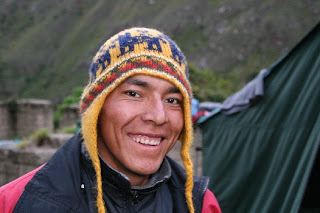 This was an Exploratory Adventure for Zephyr, which means we were contracting with a local outfit and, although we spent many hours researching the destination and working with the local outfitter to create a fantastic trip, I had not actually been on the Inca Trail before myself. I must admit I was a bit leery of the popularity of the Inca Trail and what that would do to the experience. In fact, I had already scheduled to spend extra time after the trip to research a new, alternative trek. Our group of 17 met in Lima, took a flight as a group to Cusco, and immediately ventured into the Sacred Valley of the Incas which runs along the Urubamba River between Cusco and Machu Picchu. We spent several days in the valley, visiting Incan ruins, taking short hikes, and eating way too much Peruvian food. The real goal, however, for these two days is to acclimatize to the high altitude of the Peruvian highlands in preparation for our trek on the Inca Trail to Machu Picchu. 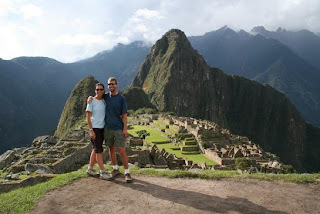 The Peruvians realize they have a tourism gem in Machu Picchu and an adventure travel gem in the Inca Trail. While there are thousands of miles of Incan trails in Peru, to step onto the "Inca Trail" which runs from the Sacred Valley to Machu Picchu requires a permit. The government limits permits to 500 per day. 500 per day sounds like a huge number to me and was the chief cause of my concern that the Inca Trail was over-hyped and over-visited. I envisioned massive numbers of people tripping over themselves on the trail, competing for limited camping spots at night, and generally ruining the experience. It wasn't that way at all. All trekkers are now required to be with a local guide, which is not only great for local employment but an excellent way to make sure trekkers have as little impact on the local environment as possible. 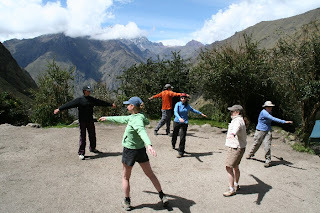 In addition, most everyone follows the system of "luxury trekking" with porters, cooks, and camp staff. 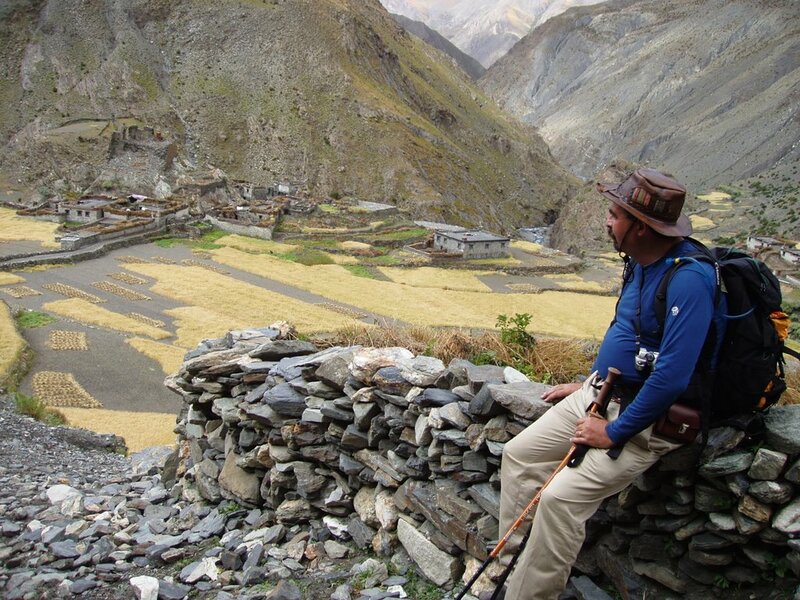 The upshot is that of the 500 permits per day, perhaps only 220 actually go to trekkers. Our group had two guides (Juan and Santiago), a cook, assistant cook, camp assistant, and over 20 porters! This was indeed luxury camping, with a cooking tent, dining tent, tea in the morning delivered to our tent doors, hot water to wash each afternoon, and delicious meals served three times per day. I think all of us were wowed by this, including those who trekked with Zephyr in Tibet (this was even more luxurious) but especially those who were new to camping. We in the Zephyr office spent a lot of time finding the right local partner for our Peru trip and we ended up with one of the best around. Our local operator is small, run by a great guy who treats our groups with priority importance, and has a few practices that are simply superior to other local companies. Among my favorite was this: Each morning on the trail, while the other trekkers left early to seemingly compete for first place, our group took our time, enjoyed breakfast, and was almost always the last to leave the designated campsite. This meant the large number of trekkers was at the worst of times not an issue and for most of the trip invisible to our group. That left the Inca Trail practically to ourselves. The Trail presents its main challenge on Day 2, rising up to Dead Woman Pass at almost 14,000 feet in elevation. This was daunting to some and a challenge for many. After that, it passes ruin after ruin, each somewhat unique and always fascinating. Juan and Santiago took us through each ruin and we learned about the Inca's life, culture, and architecture. 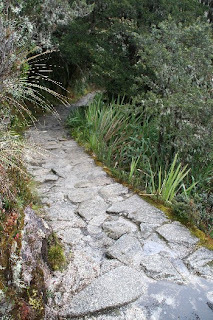 The views throughout were incredible and the trail itself is amazing, a combination of local dirt paths and the fitted stonework of the Inca masons. Camp life was fun, consisting of great meals one would never expect in the middle of the wild and stimulating conversations among our group and with our guides. No words I write here or photos I can post will do justice to the experience. By the fourth day, everyone was a little sore, a little tired, and ready for a shower and bed. We made a push up one last hill through the Sun Gate for our first view of Machu Picchu. Hanging out above the lost city for over an hour, we took in the view of this amazing place. To be honest, however, I think many of our group felt as if Machu Picchu was the cherry on top of the ice cream sundae, nice but not necessary. I felt that way myself. We had just spent four days on the Inca Tail. We had strained and perspired, enjoyed wonderful views and explored amazing ruins, bonded with each other, and in essence lived the highs and lows not just of the trail but of life itself. 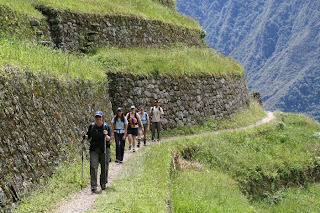 We had lived the Inca Trail for four days and I, for one, thought of it not anymore as a great adventure travel destination but as a means to understanding the Incas and Peru itself. 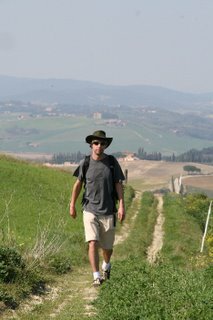 I spent 17 days in Italy this past month helping to create Zephyr's newest business division: Self-Guided Adventures in Italy. This is a totally new concept for us and a fairly new concept in the travel world, so I'll explain. Self-guided adventures are sort of a middle ground between taking a guided tour and going it alone. 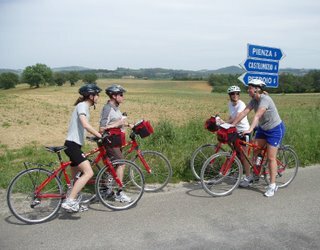 On a Zephyr Self-Guided Adventure, you will go to our website and select your activity (biking, hiking, or driving), your desired route in Italy, and your preferred travel date. We then book your hotels for you, give you detailed route directions, and provide you with a bike on biking tours. We also have a local representative who will meet you upon your arrival and help you in case of emergency. In short, we make it easy for you to have a vacation in Italy on your own. The really cool thing is that we are taking the self-guided concept to new levels. We spent much of our time in Italy videotaping our local guide, Giovanni, as he explained the sites, culture, food, and wine of the area. We will place these on "personal video players" and loan them to our self-guided participants. It's like having your own e-Giovanni with you as you travel through Italy! What's more, we are converting our printed route directions for the driving tour into a GPS system that will work in your car, just like at home. That way, you'll never get lost driving in Italy, which we know is a big concern of those who consider driving there. Self-guided tours are not for everyone. If you don't have a group with whom to travel or prefer the support of a van and p rofessional guides, a guided tour is a much better option. In plain English, if you aren't sure you could make it to the next hotel on your own, best to go on a guided Zephyr tour! However, if you are confident in your abilities, have your own group of travelers, or want flexibility in your dates, this is a good system. 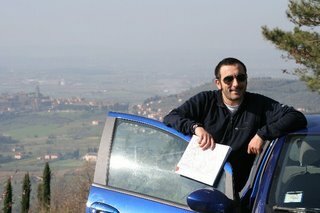 We are starting only in Tuscany and Umbria, because we know it so well. Next year? 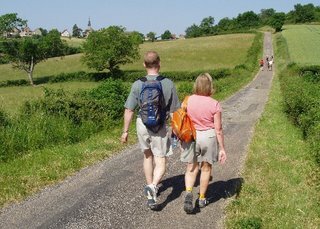 How about Self-Guided Adventures in France! Check out the website: www.SelfGuidedAdventures.com. I started snowboarding in 1994. 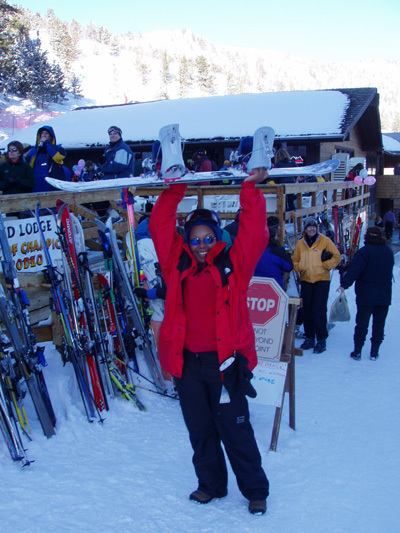 I had learned to ski while in high school but hadn't skied in years. When invited to a weekend getaway at a resort in Austria (I was living in Europe at the time), I decided to try snowboarding rather than take up skiing again. I have never gone back to downhill skiing since. "I used to ski but haven't skied once since taking up snowboarding." That is a pretty powerful statement and one I hear a lot from those who snowboard. In some ways, snowboarding is a bit of an exclusive club: those who enter love the entertainment while those who don't, don't know what they are missing. I find snowboarding to be a bit like inline skating, too. 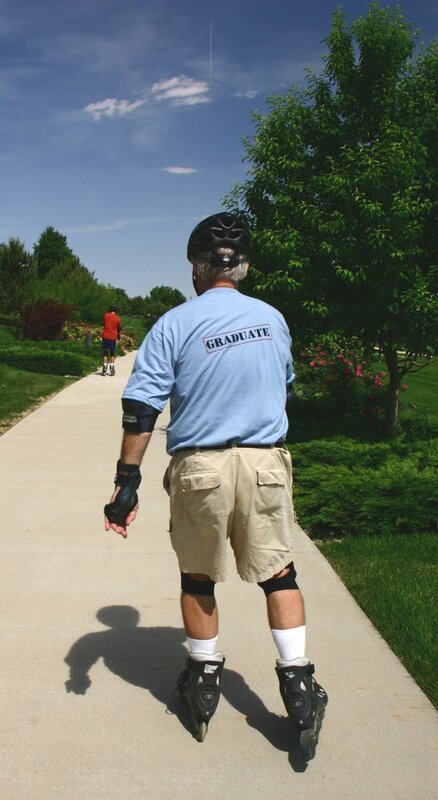 Those who inline skate regularly are fairly fanatic about the sport because it is fun and a good workout. Most importantly, I think, is that inline skating is a fluid, aesthetic motion that is pleasing to us humans. Snowboarding, with its wide arcing turns, is the same. It is a great sport and one I believe many people would enjoy, given the opportunity to learn. That is one reason we at Zephyr Adventures have created Zephyr Camp Snowboard. Following in the footsteps of Camp Rollerblade, our snowboard camps are two-day weekends, designed for adults, and created for beginners. We have joined forces with seven resorts across America in 2007 to offer these weekend camps in February and March. While kids are welcome if accompanied by a participating adult, the focus of Zephyr Camp Snowboard is on adults themselves. We want you to feel comfortable learning in a safe environment with other adult beginners. The URL we chose for our snowboard camps is www.YouCanSnowboard.com. When I sent this to a friend the other day, this 40-something investment banker emailed back and said he would wait until we created www.NoICannot.com. While I found that humorous, I hope you don't think the same way. I believe we are only as old as we feel and, more importantly, would probably age more slowly if we just acted a little younger at times. You can snowboard and we would like to help you learn. 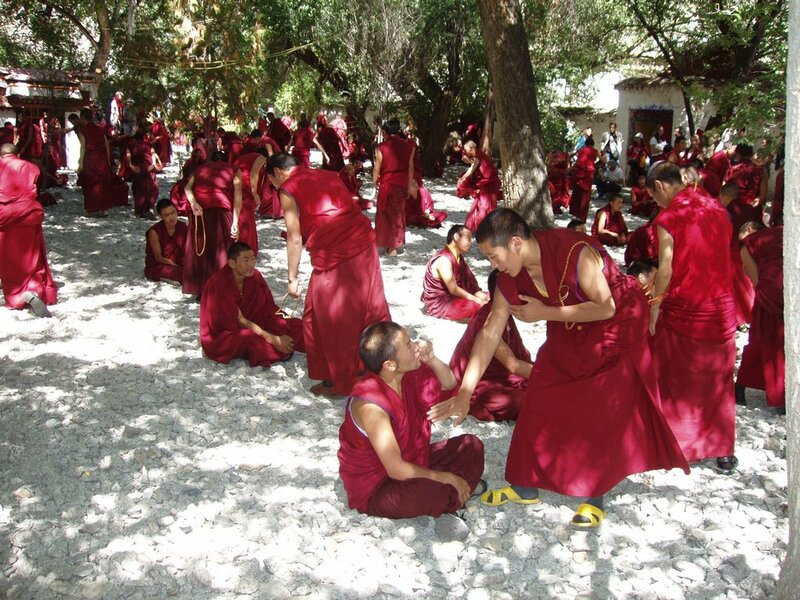 Our group of 11 trekkers and three guides were walking through a small nunnery above Lhasa. Although we had seen other tourists at the large, popular monasteries we had visited in the morning, at this nunnery we were the only foreigners around. Walking into the large prayer room, we saw a young nun who expressed some interest in our group. Talking through our guide and translator, we were able to ask her about her daily chores, when she had come to the nunnery, and even what she thought of her life as a nun. She took us back to her room for a private tour of a typical nun's quarters, offered us yak butter tea, and showed us forbidden photos of the Dalai Lama. Our group of trekkers was so impressed with this young woman's dedication to her calling, some of them wanted to give some money to support her in her hard existence. Our guide said it was okay to do so, and several of them placed Chinese bank notes on her bed. Despite the poverty nuns know every day and the comparative wealth each of us had (just the cost of getting to Tibet is a year's salary for most Tibetans), the young woman tried to decline the money, saying "You have traveled a long way and must need this money more than I." This is the true spirit of Tibet. The people are friendly, warm, and caring. The country is ruggedly beautiful and the culture, laced through with Buddhism, is intoxicating. This was my fourth trip to Tibet and, to be honest, I was not looking forward to going. It has been a crazy summer of travel (just see my other blog postings), and I could have really used two weeks at home! However, as soon as I arrived in Beijing where we would meet the group, I had changed my mind. Once we all got off the plane in Tibet and I saw our Tibetan guide and now my good friend, I was filled with the same sense of wonder and peace as always. We spent the next three days learning about Tibet, visiting monasteries, wandering Lhasa's center, and acclimatizing to the altitude. Of course, the peace and serenity that comes with Tibetan Buddhism is only half the story. Tibet is an occupied land and the occupiers, China, are forcing themselves on unwilling hosts. We heard stories about monasteries destroyed during the Culutural Revolution, people thrown into jail for peacefully protesting, and young men who had fled over the Himalaya to escape (as had the Dalai Lam) into India. While these stories made us sad, at the same time they added to our experience. Our tour was not just a vacation but an education and we were all grateful to be in school. The highlight of our trip is our four-day yak-supported trek and the highlight of the trek, for many, is our visit to a small village not reached by any roads. Our groups have been visiting this village for years and we always join together to purchase a gift for the village. This year, we purchased a large tent for community festivals and our entire group mingled with the Tibetans as we spread out the tent, took photos, toured local houses, and drank chang (barley beer) in celebration of our arrival. My personal highlight this year was a conversation I had with one of the three village elders and his wife, son, and granddaughter. The young girl had finished her four years of education in the village and, lacking money to attend the nearby school, had no future but threshing barley and tending sheep. While life in the village is primitive but good, not everyone wants to stay and when I asked the granddaughter what she wanted to do the reply was "study English in Lhasa". How much our groups had affected her thinking, I don't know. I knew I could help her and decided to "sponsor" her education. 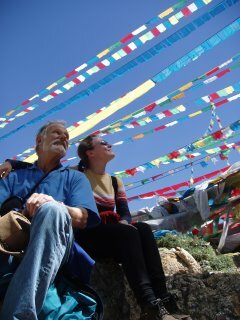 Three days later I was at an English school in Lhasa with our guide. The girl had walked six kilometers with her grandfather to the nearest road, taken a tractor to the nearby paved road, and hopped on a bus to Lhasa. She was intent on changing her life and a day's journey to an unfamiliar city was no hurdle. We registered her for five hours of English per day (plus three hours of Chinese) and a year's worth of education cost me $250. She was estatic, her grandfather was thankful, my friend and guide was proud, and I was perhaps the most emotional of all, knowing I had helped change a young life. We had originally planned to remove the trekking portion of our Tibet trip in 2007, giving those of you who don't want to sleep in a tent a chance to visit Tibet with us. However, after again experiencing the wonders of rural Tibet, we have decided to add it as an "optional four-day extension" to our standard trip. You can now choose the regular 10-day Tibet and China Hiking Adventure (including two days on the Great Wall and the rest of the time in Tibet) or a 14-day trip that also includes a trek. Both are amazing. It was the second day of the tour and I was blown away by the comments I was hearing. "That was a perfect day." "Absolutely fabulous." "This is the best skating tour I have ever done." Now, we often get great comments like this or, frankly, we wouldn't be in business. To receive them all at once as our participants were finishing up the day's skate was quite emotional. To think I had a hand in bringing 26 participants from all over the US, Canada, and the UK to the backcountry of northern Idaho and giving them such a praiseworthy experience makes what we do quite worthwhile. 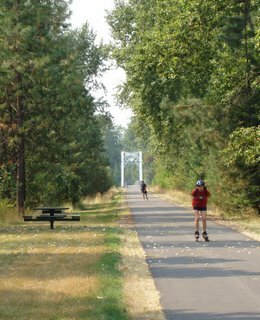 The reason for the high praise, of course, had a lot to do with the 73-mile Trail of the Couer d'Alenes. This trail runs through some amazing country, along a river, next to several lakes, through farmland and forest, and across the panhandle of northern Idaho. There are stretches of 10 miles with no road crossings! Plus, the pavement is pristine and the terrain is flat. This is a skater's dream. Our trip started in Spokane, Washington, where we picked up the group from the airport. We shuttled through wheat fields and past small towns to the start of the trail in Plummer, Idaho. 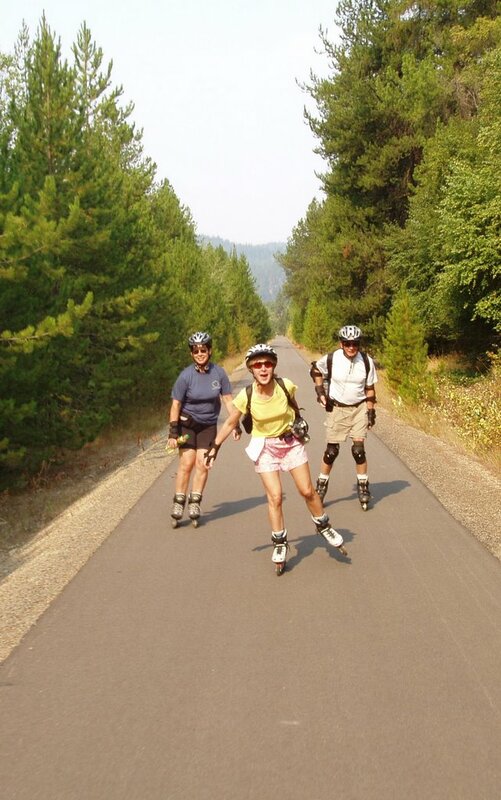 Those who elected our Medium Route had the rush of starting the week with a six-mile downhill skate on a forested path that was steep enough to keep us rolling but not so steep as to require much braking. What a start! 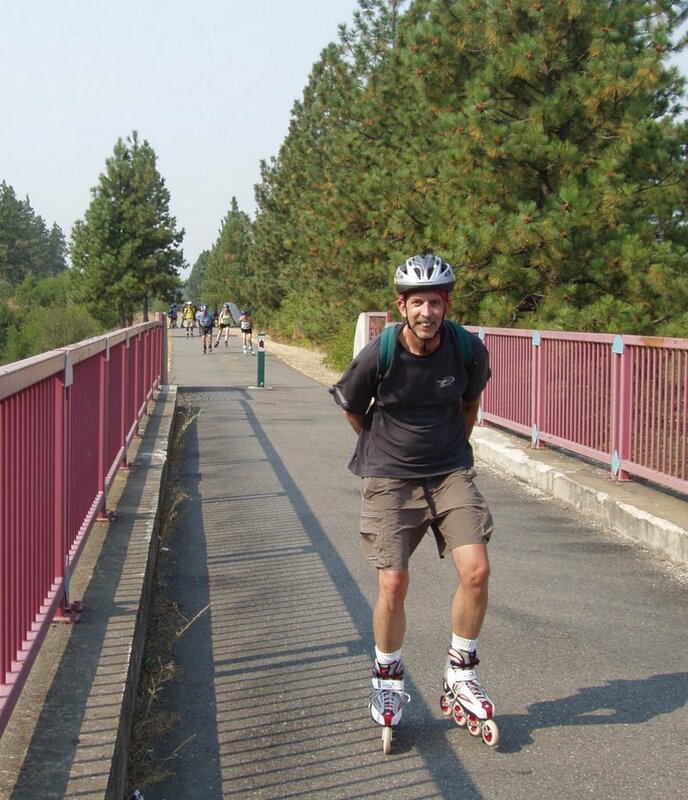 In Zephyr's traditional manner of providing options, those who elected the Short Route started at the bottom of the hill with a pedestrian-only bridge over the Coeur d'Alene Lake followed by a 10-mile stretch uninterrupted by even one road crossing. Long Route skaters chose to first skate UP the hill for a workout before heading back down. That set the tone for the week and it was not difficult for this group of 29 people (including the three guides) to have a great time. We enjoyed a variety of fine meals, swam in the Spokane River, played a game of beach ball volleyball, and skated, skated, skated. Perhaps the best aspect of the trip, however, was the bonding that occurred among the group. With 29 people, there will always be a variety of personalities, ages, and backgrounds. That such a diverse group of individuals can form into one family-for-a-week is really amazing. I noticed this time after time. Nancy told me she sat next to new people every night at dinner "because everyone here is so interesting". When Barb was swimming in the river, I saw people watching her to make sure she was okay. Individuals on both sides of the volleyball net became instant teams, even giving nicknames to players. When Patricia was still out on the trail one day when most had arrived back, several people came up to me and expressed concern. However, it was when we had to take 20-tour veteran Ralph Clayton to the hospital for a potential heart problem that this bonding really hit home. It turns out Ralph was fine and the hospital visit was just precautionary. While he was there, we toasted Ralph at dinner, visited the hospital, and shared our concern for him. I think many in the group realized that life is finite and the opportunity to spend five days with a group of great people doing something we love is what life is all about. Because I just ran two trips back-to-back, this posting is right on the heels of the previous one about our Colorado Adventure. 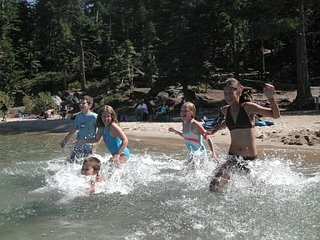 While both trips were multisport adventures, the one in Lake Tahoe, as a Family tour, was wildly different. We only started running Family Adventures last year, with an initial Yellowstone trip done as a test. 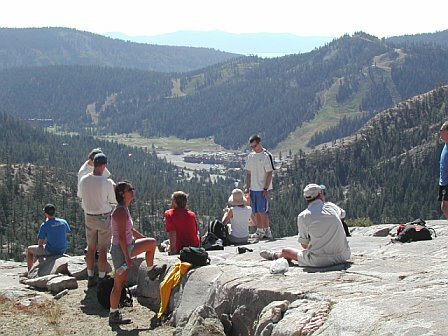 It was incredibly successful and we had all 14 participants from that trip sign up for the Lake Tahoe Family Adventure this year. In addition, my niece and nephew, Erica and Brian, brought with them their parents (my brother Dave and sister-in-law Sharon) and their grandparents (my parents Spencer and Beverly). So, this was indeed a family trip for me! Our family adventures are designed with both the parents and kids in mind. The key concept is to structure the tour so some activities are enjoyed by everyone as a group while other activities are done separately. For example, on one day our entire group went rafting on the Truckee River, coming home with wet clothes and exciting stories of the "Jaws" rapid. The next day we split the group for a hiking day. Most of the parents and older kids did a long hiking route of six miles that went uphill to the top of Squaw Valley. The short route, attended by all the younger kids and some of the parents, took a gondola ride to the top where the group did a shorter hike. So, everyone enjoyed the rafting together but those parents who wanted a workout could do the tougher hike without worrying about their kids. After three days, because of the activities I was leading, I found that I had spent most of my time with the adults and older kids. I hadn't yet bonded (on this trip at least) with the younger kids. One of my best experiences of the tour was to quickly change that! Getting done early from a biking day, I drove the kids back to the hotel and the outdoor pool. I jumped in with Erica, Brian, Wendy, Adam, Noah, and Rebecca and was the immediate center of the kids' attention. For the next two h ours, I got a workout by throwing balls, playing Marco Polo, and carrying kids around on my back. It was great fun and I think indicative of the family tours. The kids just want to have fun and that is what happens on the family tours. While the parents might love that they are not responsible for making decisions, don't have to drive a car, and can leave their kids in our hands for much of the tour, the kids simply want to have fun. And whether it is singing in the car, playing games in the park, or taking part in our scheduled activities, they definitely know how to do it! Next year we will have two Family Adventures: Yellowstone and Colorado. I am sure glad we added the family trips! We have been running our Colorado Skating Adventure for years. Last summer, four of our High Rollers (repeat customers with at least 20 Zephyr trip days) asked us to add hiking to the itinerary. Happy to oblige, we created our Colorado Hike & Wheel Adventure that ran from July 30 through August 3. 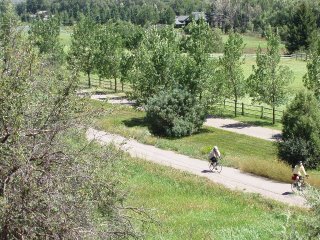 The trip was structured to have alternating activities: hiking in the Colorado mountains and either skating or biking on some of Colorado's best paved trails. 18 people joined guide Terry Lynch and myself on this tour. The trip took place in Summit County, Leadville, Aspen, and Glenwood Springs. 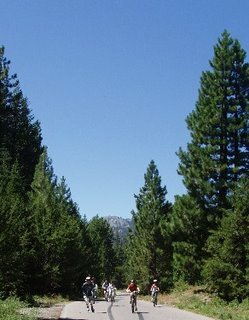 All are great areas with incredible mountain views and fantastic trails, both dirt and paved. I won't go over the five-day trip in detail but wanted to write about one highlight. 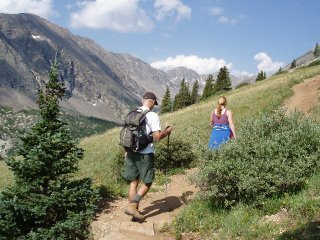 The best hiking day was near Breckenridge when we had two distinct options. The "easy" option was a six-mile round trip hike to Mohawk Lake. The group who did this hike came back with raving reviews about the trail, the scenery, and the bag lunch everyone enjoyed sitting at the base of an alpine waterfall. I led the second group on the harder option, a climb up 14,265-foot Quandry Peak. 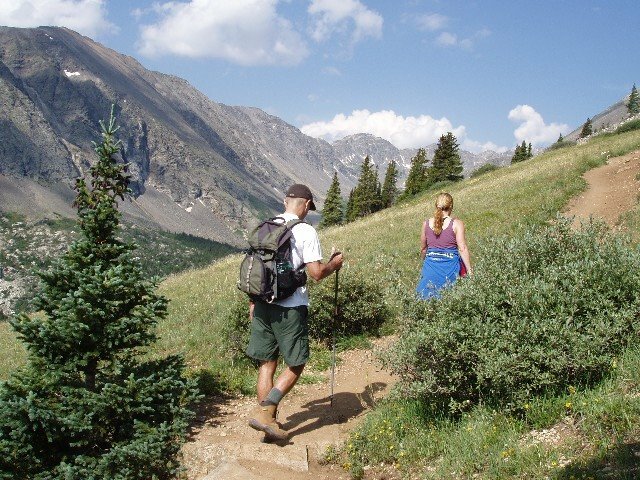 While the hike itself is not long (6.75 miles and 3400 feet of elevation gain) and requires no technical skills, hiking at altitude is always much more taxing than hiking at sea level. We discussed this at length the night before the hike and the nine people who chose to attempt Quandry knew they all had the option to turn around part way up the trail. The ten of us quickly spread out on the trail as we each found a comfortable walking pace. We soon rose above the treeline and could see the long, uphill trail in front of us. The secret to hiking at this type of altitude is to go slowly; at the same time, we were very aware that we needed to make progress before the afternoon thunderstorms arrived. Starting in the back and working my way forward, I tried to make sure each member of our group had a realistic understanding of his or her chances of reaching the summit. I was also constantly watching the thunderclouds on the horizon, checking to see if they were headed our direction. I eventually made my way to the front of our group where two members (Kirk and Tina) looked very strong. Tina was even hiking in open-toed sandals! By the time we reached about 13,500 feet, however, Kirk and Tina were discussing whether they would continue. I asked to take the lead, slowed down the pace, and the three of us continued steadily to the summit. It felt great to be on top! Eventually, two other hikers (Rick and Tony) also summited and I celebrated with them as we took photos and signed the register on top. While four made the summit, the rest turned around at one point or another. Neither they nor I saw this as a failure, however. Instead, I think each person who attempted Quandry Peak that day learned something about high altitude hiking - and perhaps about himself or herself individually. It was a great experience that I know others would love to have. We'll leave Quandry Peak or another 14,000-foot mountain on the itinerary. Overall, I thought the trip went extremely well. The mix of activities was fun and Colorado is the perfect state to host an adventure tour, with its amazing scenery, towns, and recreation. Pinot noir, chocolate crepes, and escargot. Notre dame, the Eiffel Tower, and the Musée d'Orsay. Biking through vineyards, skating on canal tow paths, and hiking to a hillside church. There is so much happening on our Burgundy and Paris Multisport Adventure it is hard to know where to start my blog. Burgundy, a province in the eastern part of France about five hours drive from Paris, is known for its food and wine. We have been visiting Burgundy for four years now, however, primarily because of two long, paved, and beautiful paths in the heart of the area. We start our tour skating along the Canal du Centre in the town of Chalon-sur-Saone. The path running along the canal is just perfect for skating. Because a number of participants on this trip were not experienced skaters, I took about 1/3 of the group to one end of the trail for a short braking clinic. The rest of the group started skating from the end of the path near our Chalon hotel and one of my two co-guides on this trip provided advanced skating instruction while on the trail. It was gratifying to hear how much people liked the path but more so to hear one skater tell me he had learned more about skating in one day than in all his previous lessons. 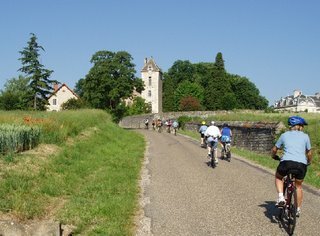 The activity continued in Burgundy with successive days of biking, hiking, skating, and hiking. On this trip, I ended up supporting the route in our Zephyr van on both skating days and so was able to bike the long route on our biking day and hike both days we were on foot. 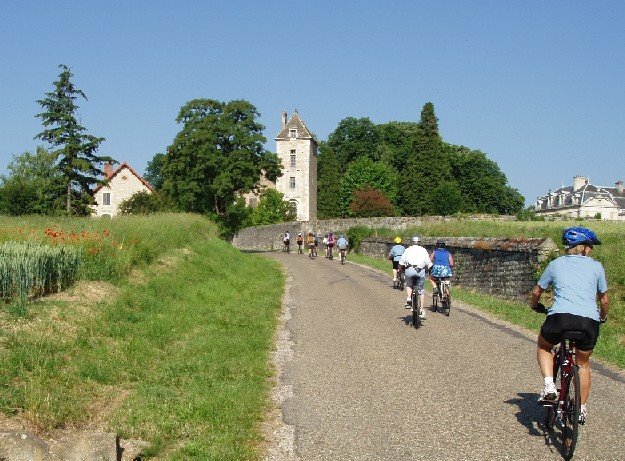 Since I love getting off the trails into the Burgundy countryside, that was fine with me. However, it was during one of my driving days that I had my best day in Burgundy. While the group skated from our hotel in the small town of Buxy to our hotel in the slightly larger but more famous (for its ancient abbey) town of Cluny, two of us drove the support van and transferred the group’s luggage. We then went to the local grocery store to purchase ingredients for a surprise picnic lunch. The menu? Freshly prepared salad with lettuce, tomatoes, cucumber, olives, and potato; French bread straight from the bakery; four kinds of cheeses and five kinds of sandwich meats; cashews, almonds, and pistachio nuts; fresh fruit including melon, oranges, and kiwi; cake, cookies, and French chocolates for dessert; water with a flavor of mint to wash it all down; and freshly picked wildflowers for the table. It was a feast and when our group rolled up to the picnic area, situated alongside the trail in a wooded park, they were happy to see us! Naturally, on a normal basis I much prefer hiking, skating, or biking to driving the van. However, this day was special because I felt like I belonged in France as I shopped and prepared a very European picnic. The compliments from our participants didn’t hurt! After five days in Burgundy, we boarded a chartered bus for the ride back to Paris. That evening, we had a quick dinner before heading to the Friday Night Skate. With thousands of skaters participating (the skate runs every week and averages 10,000) we quickly separated and enjoyed the amazing experience of skating through the streets of the city – at night – in a huge crowd. We met again at the break and were so pumped up by the experience that at midnight we skated up to a sidewalk café for a post-skate drink. 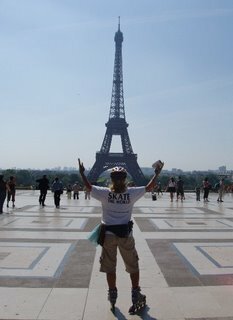 The next two days we toured the major sights of Paris on skates. Many in the group were nervous about skating in Paris and, granted, it is more difficult than skating on a nicely paved path. However, with a little encouragement and some pointers on how to navigate the city, our group headed down side streets toward the Eiffel Tower. Two days, dozens of kilometers, and an entire city later our group of nervous skaters were quite impressed – and justifiably so – with their successes skating in Paris. I can relate the details but it is hard to relate how emotionally satisfying the last week has been for me. I absolutely love Europe and France is one of my favorite countries on the continent. I have been to Burgundy half a dozen times and it now feels as if this little corner of the world is a second home. Because of this feeling, it is that much more rewarding to be able to show off my “home” to our tour participants. 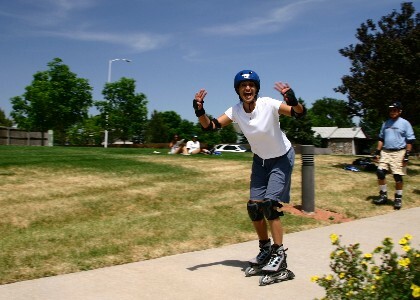 This past weekend I had the pleasure of participating in Camp Rollerblade Denver. 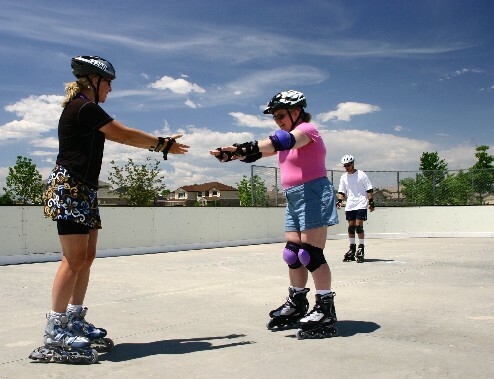 This two-day camp was part of the 13-city schedule of Camp Rollerblade Weekends in 2006. We had a relatively small group of nine students at the Denver camp. (Our average is more than twice that and many camps sell out at 24 students.) Participants ranged in age from 17 to 60 with an average age of 42. Three of the participants had never skated before and all were shaky on braking and other fundamental skills prior to camp. As the owner of Zephyr Adventures, the company that runs Camp Rollerblade, I don’t normally get to instruct at the camps we run around the country. However, since I live in Boulder only 10 miles from the Denver camp location, I was lucky to be able to teach at this one. Kris Thomas, a full-time Zephyr employee in our Red Lodge, Montana office, drove down to join me at this camp as my co-instructor. The camp started at 9:00 AM on Saturday and was held in a private rink in a city park with nearby benches, picnic tables, and a bathroom. We started with introductions and a discussion about skating, equipment, and safety gear. We then started out with the basics: how to stand without rolling, how to get up off the ground from a sitting position, and how to fall safely without hurting yourself. Once in the rink, we learned Stride One (the beginner forward motion stride) and skated from one side of the rink to the other. At the beginning, as I am sure all the participants would agree, it was quite a sight! No one could stop so we just banged into the rink wall each time we came to the other side. Legs were wobbly and balance was precarious. However, we kept falls to a bare minimum (in fact, I don’t remember any on this first drill) and everyone had smiles on their faces by the time we took our first break. The key to skating is to learn to stop and that was our next order of business. Using the heel brake is not a natural motion at all and generally requires instruction. We broke the motion down into parts and, by lunchtime, most people were stopping fairly efficiently. We ended the morning session with a game of “Red Light, Green Light” on skates. The two days progressed in a similar manner. New drill, practice, fun game to reinforce the concept, and then a short break. Learning to skate comes in waves and periods of enlightenment, when everything we are saying seems to all of a sudden click in a student’s mind (and body). I remember Barbara, who struggled with braking until she watched her daughter Tessa demonstrate it properly. Boom – she had it down. Or Jed, who started out only wanting to stroke with one foot before all of a sudden learning to use both in his stride. The final afternoon we headed out of the rink to a local trail to practice our skills in the real world. The trail was beautiful and the real-life conditions made it exciting! Everyone did great. We practiced going over rough terrain (including sewer grates), skating up small hills, braking down hills to control our speed, and even perfecting the grass stop (a rolling stop into the grass rather than a flailing of all limbs in a last-ditch effort). My final memory of the trip was when Savita struggled to perfect the grass stop on a slight decline. Throwing all caution to the wind, she headed down a steeper hill, caromed into the grass, and executed a perfect grass stop. A fitting finale to the weekend. Congratulations to our nine students and all veterans of Camp Rollerblade. You deserve a round of applause! If you yourself are eager to skate or know someone who is, please send them to www.CampRollerblade.com! Last night I returned from two weeks in Italy where I helped run our Italy Biking Adventure. 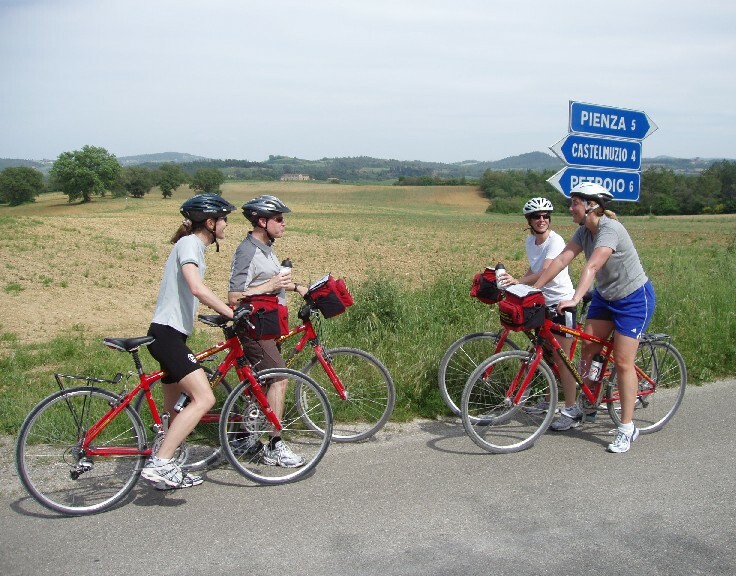 18 participants joined our team of Italian and American guides for seven days of biking, sightseeing, eating, and drinking in Tuscany and Umbria. Tuscany is perhaps the most famous province of Italy, having been popularized by the book and movie Under the Tuscan Sun. Winding roads, ancient hilltop towns, lush vineyards, and amazing sunsets are all part of Tuscany's charm and justify its fame. 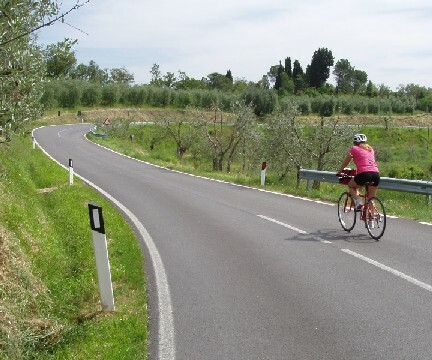 However, the area is also hilly and there is no getting around the hills when bicycling in Tuscany. Umbria, on the other hand, features a large flat valley with hills on either side. Less famous than its neighbor, Umbria nevertheless has great wines, wide-open scenery, and fascinating towns. Plus, there is the advantage when on a bicycle of that flat plain. While most people who visit this region of Italy tend to see either Tuscany or Umbria, our seven-day tour features both areas. Our cyclists appreciate it. Our tour started in Siena, a beautiful town in the heart of Tuscany famous for its wild horse races in the central "campo" of the historic district. Meeting in the morning, we shuttled to the wine-centered hilltop town of Montalcino where the group arrived to find 22 shiny bikes - our wheeled companions for the next seven days - nestled under the walls of the Montalcino castle. After introductions and an overview of both the trip and the bikes, we started on a ride through the Tuscan countryside. Our route took us on both paved and dirt roads, avoiding traffic when at all possible, and featured a stop 10 kilometers in at Casata Prime Donne winery, the only one in Italy owned and operated entirely by women. Most of the group left with one or more bottles of the delicious brunello wine, specialty of the Montalcino area. Shortly after the winery, the route had a junction where those looking for a shorter ride headed to our hotel and others looking for a workout could elect a longer option. Our hotel, a converted farm (Agriturismo) situated on a ridge with incredible views of the area's rolling hills, also provided our dinner for the evening, an amazing Italian meal made with ingredients that came straight from the farm. The menu consisted of bread, salad, spelt soup (made from a grain common in Tuscany), artichoke risotto, veal with a spinach sidedish, dessert, and all the wine we cared to drink. Mama mia! This first day was typical of our subsequent days and I won't go over each day in detail. The biking was excellent, always with multiple distance options and detours to ancient towns, abbeys, and fortresses. We also had a variety of non-biking fun, including an olive oil tasting, a wine & cheese pairing, a culture talk on the differences between US and Italian culture, and an historical walk featuring everything from a Renaissance church to a Roman aqueduct. Each evening we would have an amazing Italian dinner, featuring local pastas, bruschetta, pizza, meats, salads, and always the fantastic Italian wine to wash it down. And the biking? With three routes available on most days and van support there when needed, this tour is designed for all ability levels. Many of our participants on this trip laughed on the first day when describing how they had not been on a bike for years, while a few others were frequent riders and brought their own specialized pedals. The goal is to accommodate everyone and I think that was definitely achieved. Tours like this tend to end all too quickly. Seven days came and went with unbelievable speed and I find it hard to grasp that just two weeks ago I was arriving at Rome's airport for the start of my Italy stay. While the trip is finite, the memories last a lifetime and I am sure all 22 participants and guides will long remember this past week. For me, my best memories are always of small things. While I like touring Rome or seeing the sights of Tuscany and Umbria, I most enjoy feeling that I have become involved in the local life in some little way. Getting up in the morning for a run in the fields surrounding the hilltop town of Pienza ... having a glass of wine with our Italian guide Giovanni upon our arrival in Sansepolcro, still exhausted from plane travel ... sitting at a table in the out-of-the-way town of Lucignano watching the two 70-year old proprietors shuffle back and forth bringing fresh meats and produce to their guests ... or stopping for water in the center of Bevagna, watching as the local policewoman casually eyes our bicycles before telling a resident driver to move her car from the auto-free zone. Italy is an amazing country and everyone should go there at least once in his or lifetime. Italy 2007, here we come! I returned home a few days ago from the California Wine Country and our first ever Biking Adventure in the area. I must say, I was very pleased with the tour! 14 participants joined my co-guide Gary Passon and me on the five-day trip. We started in Sonoma, biked across the county line into Napa Valley, and spent a few days in that beautiful area. We then crossed back over into upper Sonoma County and the Alexander Valley. The key to the trip - and what everyone I tell about it wants to know - is how the biking part mixed with the wine tasting part. I must say I was pleasantly surprised! Most participants were there for both the biking and the wine tasting and we tried to accommodate. We had three biking routes each day (Short, Medium, and Long) and tried to place the bulk of the riding in the morning hours. That left the afternoons for the wine tasting. So, as a sample day, the group might have ridden 20 miles in the morning to a good lunch spot without any winery stops on the way. In the afternoon, we might travel another 10 miles but stop at four or five wineries to taste the delicious local wines. Each person chose whether to drink or spit and how many wineries to visit. However, we found that with a mile of riding in between each winery, we had a great time and never felt as if we were jeapordizing our safety. Personally, I had two favorite experiences on the tour - one related to biking and one to wine tasting. The first was when I was able to ride the Long Route on the third trip day with tour participant (and friend) Greg Johnson. The route was 50 miles long and only four of us total elected to bike it that day. Greg and I pushed each other and had a great time. In fact, we were so beat by the end of the day that neither of us wanted to stop at a winery! The other memorable experience I had was on the fourth day. I drove the support van that morning, shuttling a few of the Short Route bikers part way, dropping off the luggage at our next hotel, and then shopping for a picnic lunch we set up at the Alexander Valley Winery. After lunch at the winery, I swapped with Gary (who rode in the morning) and was able to ride the last 10 miles to the hotel. Of course, that meant I was able to visit the wineries! By the time Gary and I were done cleaning up the picnic, most of the group had already started out. I rode with Cathy, Chad, and Theresa and the four of us stopped at four wineries that afternoon. We had a great time sipping the different wines, chatting with the winery staff, and enjoying moving through the incredible scenery on our bikes. What a day to remember! The California Wine Country is truly an incredible locale and biking is really a great way to see the area. I am pretty excited about the prospects of this tour becoming quite popular for us as more people learn how fun it can be! 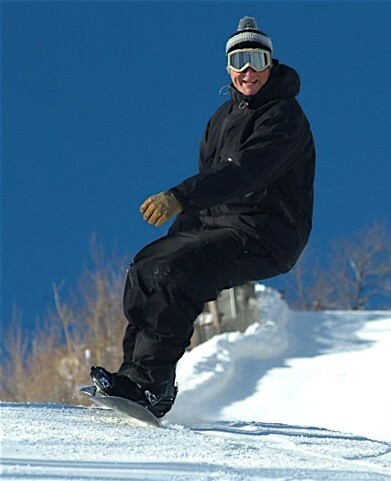 Allan Wright is the president of Zephyr Adventures and has been creating active vacations since 1997. Zephyr runs trekking, skating, wine, family, and self-guided trips around the world. Allan frequently travels the world, both running Zephyr's trips and researching locations for new adventures.